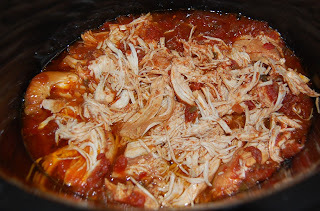 A lot of people gave me Crock Pot recipes on my Hey, It’s Okay Tuesday post. To repay the favor, I wanted to share one of my favorite (and easy!) Crock Pot recipes. Don’t have a Crock Pot? Well, guess what? On Black Friday at Wal-Mart, they have a good one on sale for only $8! Granted, you might have to battle some crazy shoppers but here’s some more good news! Wal-Mart is starting Black Friday 10 PM on THURSDAY! So you can battle them at a more respectable hour. I call this Salsa Chicken. And actually, a few readers gave me a recipe just like this one so it must be a popular easy recipe. 1. 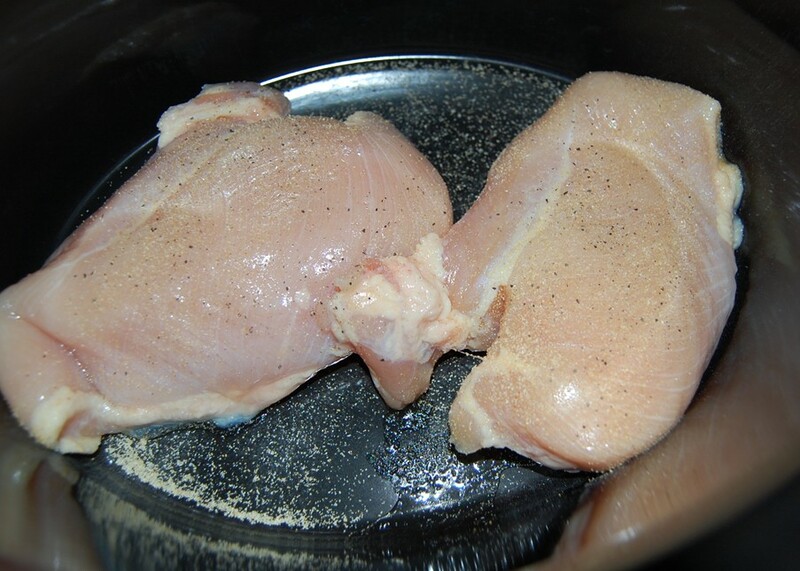 Put the chicken into the crock pot and add the seasoning you like. I usually add garlic powder, because we love garlic in this family and will do anything to ward away pansy vampires like Edward. Then, I add salt and pepper. You can trim the chicken if you’d like but I never do since you can’t even taste the fat when it’s cooked. 2. Cover the chicken with the salsa of your preference. I usually get whatever salsa is on sale. The mild kind, because I’m the only one who can stand extremely spicy things in this family. 4. When the chicken is done, shred it with a fork. Turn it to warm and add the sour cream. Put as much as you like. I usually get the smallest container and add all of it. Mix it in and let sit for 10 minutes. 5. Spoon onto soft tacos and enjoy! You can even have this on paper plates so you don’t have to clean more dishes. Fantastic, right? That looks great and I will try it as i have a crock pot that's main purpose is to collect dust. btw could you please reprint your recipe for chicken and bacon....i remember reading it a while ago, wanted to try it and couldn't find it again. and bacon was on sale so I have a surplus of it so I NEED the recipe. PS Tell the hubby I said thankyou and happy veterans day. That looks great and I am leaving for the grocery store in a minute - gonna add salsa to my list! Thanks! Ohhh, that looks so good!!! Perfect! Gotta love dem crockpot days. Reminds me of one of my favourites meals my mom makes. She makes lots of fabulous foods, but there's this meal. It just tastes soo good... but it's sooo easy. I always ask for it on special occasions. But I've never made it in a crockpot before. That looks brilliant! Thanks for passing on the recipe, Amber. I love when I find a recipe that I already have all the ingredients for! Aren't crock pots the best?! This looks amazing. And I actually have all of the necessary ingredients in my house, for a change! I know what I'll be making for dinner tomorrow! Thanks! Goodness that looks delicious. I was seriously craving something Mexican last night and now it's back! That looks great! Will definetly try that! Definitely going to try that. Looks good. It doesn't get any easier than that, does it? It's yummy, too. I made something like it back in the winter, when I didn't have anything much fresh in the house, but had tortillas and chicken in the freezer, and salsa in the pantry. Worked like a charm! Hey - that sounds great! I wonder if I could get my husband to eat it. He's not a big Mexican food eater. Oh what the hell - everybody's got to try something once, right? Oh that is easy! The smell is One of the best things about using a slow cooker. Never made something like this in my slow cooker, definitely going to try it, thanks. 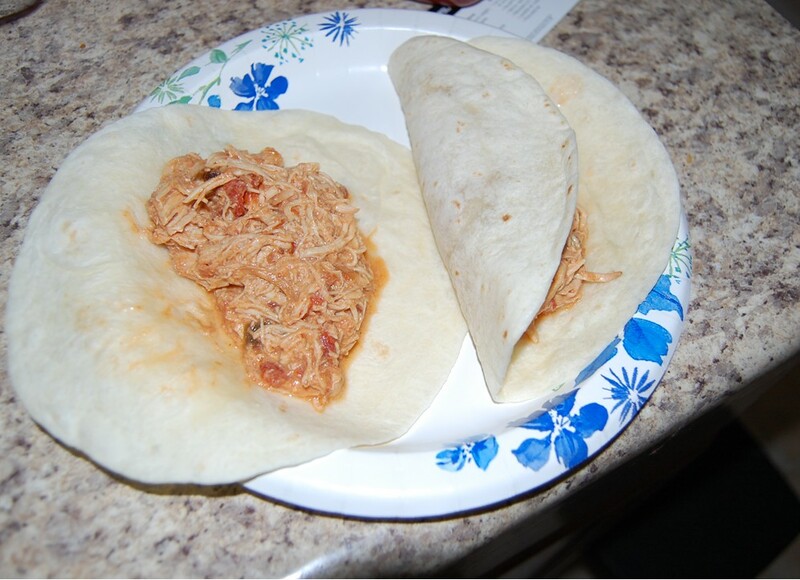 I do love the crockpot & easy meals like this, yum-my! Since I am all for 5 ingredient of less recipes? I am all over this one. Oh, that and my newfound addiction to sour cream. That looks really yummy. I love easy slow cooker meals. Everyone talks about the Crock Pot. Maybe I should get one. We don't have Black Friday here though - so I might have to pay more than $8 for it! There's a local salsa that is absolutely perfect for this recipe http://merzsalsa.com/ I suggest the black bean and corn, something I practically eat with a spoon right out of the jar. Funny how we get into ruts with our cooking. I haven't made salsa chicken in YEARS. Clearly I'm overdue. This looks perfect. Simple and delcious! Couldn't be better. Holy crap, that looks like something I could actually do. I need to try this! Sometimes I don't have luck with crockpot recipes, but I don't think anything can go wrong with this one. I made this last night. It was really good. 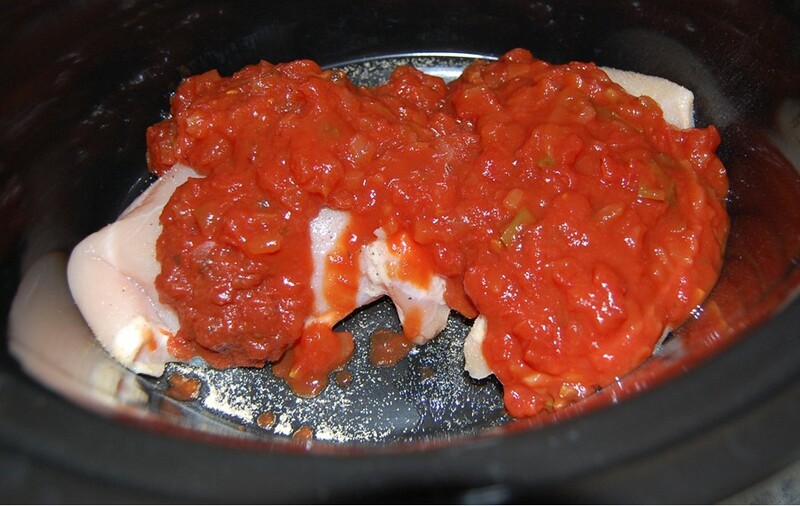 The one thing I botched was I only did two chicken breasts so there was more sauce than meat (although I'd have drunk the sauce like salsa soup, to be honest). Next time i'll throw in four chicken breasts instead of two.